Visit six of London’s biggest attractions with one ticket usable across 90 days. Get aerial views of the city on the London Eye; take a sightseeing cruise along the River Thames; hang out with your favorite celebrities at Madame Tussauds; take the Shrek’s Adventure! 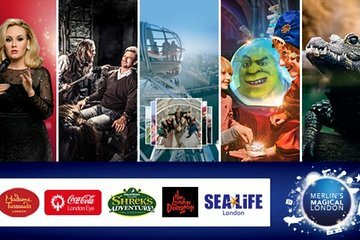 Tour to explore the DreamWorks animated movie; discover marine life at SEA LIFE Aquarium; step into the London Dungeon for an interactive retelling of London’s history. Please note: Madame Tussauds will be your first attraction booked with timed entry and cannot be changed. Your other attractions timed entry can be pre-booked through the supplier portal, refer to voucher for details. Alternatively your other attractions timed entry can be booked at Madame Tussauds- first attraction booked.